Are you thinking about starting your own emergency food stash? If so, you’re probably wondering to get started and where to buy from. After all, what sites can you expect to find packed, freeze-dried foods that will last decades and still taste great? Luckily, there are a handful of legitimate long-term and emergency food services you can purchase from. One of those options is Valley Food Storage. They have everything you need to start stocking up on emergency foods, from breakfasts and dinners, to side dishes and meats. They even provide dairy products like milk, cheese, and yogurt. The aim of Valley Food Storage is to provide their customers with the best product and service possible. The founders, Wayne Hamilton and James Tolboe, didn’t feel the current offerings were good enough for their families, so they decided to create their own. When it comes to long-term food storage and emergency food with Valley Food Storage, you have tons of options to choose from. You have the ability to order individual meals, but you can also start building your stockpile of emergency foods thanks to the kits they offer. They have value options which provide you with one month, three months, or one year worth of food. They also have premium kits with the same options. The main difference is the amount of servings you’ll get in the value versus premium kits. You can also choose one of their plans that allow you to pay by the month. It’s the perfect option for someone who wants to invest in long-term food storage, but maybe doesn’t have the budget right now to shell out all of the cash that’s required. They offer basic, standard, and advanced monthly plans, which will help you find something that suits your needs. This is a really unique and interesting way to prepare for an emergency without shelling out tons of money upfront and very few other companies offer it. They even offer a variety of speciality kits which provide you with an assortment of breakfast options, entrees, dairy, freeze-dried meats, and even a selection of fruits and vegetables. It’s all up to you what you’d like to order, but they’ve made it easy with these kits. You can get an assortment of foods delivered to your door with just a few simple clicks. It’s important to do your research and determine what you really need in your food storage. That will help guide your purchase so you get everything that you need to feed you and your family in case of an emergency situation, instead of just guessing what you need. When you think of emergency preparedness foods, you probably don’t get too excited about it. After all, you don’t expect that you’re going to be eating some of your favorite foods that have been freeze-dried and stored in a pouch, right? Well, that’s not the case with Valley Food Storage. Just because you’re building a stockpile of emergency foods, it doesn’t mean your foods have to be bland and boring. They actually provide you with a ton of options to choose from that, from my experience, actually taste pretty good. They have many dishes for breakfast that aren’t just your typical cereals. They include an assortment of oatmeals like Maple and Brown Sugar, Apple, and Strawberry. There are also favorites like Gluten-Free Buttermilk Pancakes, Strawberry Cream of Wheat, and a simple Multi-Grain Cereal. For lunch and dinner, you can get dishes like Irish Pub Cheddar Potato Soup, Enchilada Beans & Rice, White Bean and Lime Chili, Pasta Primavera, Chicken Teriyaki, Tomato Basil Soup, and Creamy Mushroom Soup. You’ll also find side dishes like Freeze-Dried Asparagus, Freeze-Dried Vanilla Greek Yogurt, Freeze-Dried Cheddar Cheese, and Freeze-Dried Coconut Milk Bites. You can even order freeze-dried meats like chicken, diced beef, and sausage. 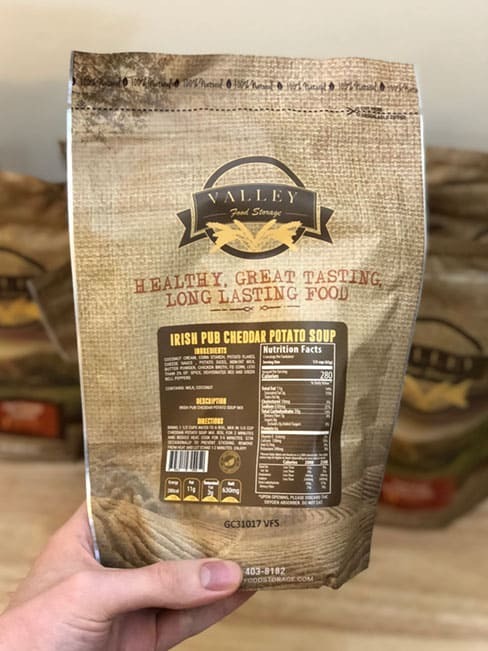 Valley Food Storage also offers a selection of freeze-dried fruits and vegetables like bananas, blueberries, peach slices, pineapple chunks, corn, peas, green beans, and many others. It’s safe to say you really have an assortment, you don’t have to worry about your emergency food being boring, and they’re all relatively healthy (when compared to regular sugar-packed cereals or other breakfasts). Orders from Valley Food Storage can be shipped across the United States. They offer free shipping on all of their products, unlike a lot of other long-term food storage companies out there. None of the food needs to be kept cold, which means you don’t have to worry about it spoiling during transportation. It won’t required any kind of insulated cooler, dry ice, or anything else of the sort. You’ll simply open up your box and find all of your individually packed meals inside. To ensure your food stays fresh while it’s in storage, a special kind of packaging is used. 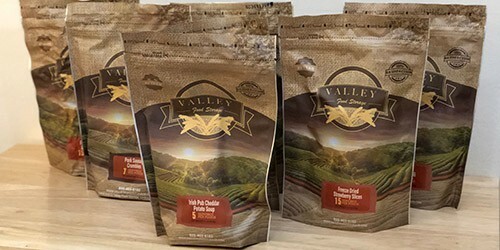 Valley Food Storage uses a resealable, thick, 55 mm Mylar packaging for each of the packets. They also use a nitrogen flushing process, which helps ensure your food lasts a long time. In fact, the items have a 25-year shelf life, which means they’ll be safe for consumption for years to come. When you consider these foods have a 25-year shelf life, you might wonder just how great they’re going to taste after being stashed away for years. It’s only natural to have that kind of concern, but it’s safe to say you don’t have to worry about it with Valley Food Storage. Their meals contain real ingredients that you can actually pronounce. There are no fillers, artificial preservatives or chemicals, or hydrogenated oils. With quality ingredients, you’re going to get a fresher, better tasting meal that you can actually enjoy eating. Another great thing about their service is that they allow you to buy meals and meat that have been packaged separately. There’s a lot of question about the shelf life of meat, as many debate whether or not it can really last all that long. If you’re worried about this, you can purchase your meat separately, so you don’t have to worry about the meat breaking down and effecting the other ingredients it has been packaged with. As with most dehydrated and freeze-dried foods, they couldn’t be easier to prepare. You’ll receive individual packages of each meal and all you have to do is add water. Specific instructions for preparing your food will be on the back of the package. In most cases (as seen in the GIF above) you’ll bring some water to a boil, add in your food mixture, and let it cook a little bit longer. Within minutes, your meal will be ready for you to eat. If you’re dealing with freeze-dried fruits, it’s even easier. You literally just add water, let them sit for a little while, and “presto” you have rehydrated fruit. Your initial thoughts might be that dehydrated and freeze-dried foods couldn’t possibly be flavorful. But that really isn’t the case with Valley Food Storage. Because their meals are packed with real ingredients, they are going to make for better tasting meals. For lunch and dinner, the Irish Pub Cheddar Potato Soup is easily a favorite of ours. On a regular day it’s a must-have comfort food, but even as a freeze-dried emergency option it’s still tasty. It contains potato flakes, cheese sauce, potato dices, bell peppers, and spices. Another popular item is the Pasta Primavera and we can see why. After all, who doesn’t like a delicious dish of pasta? It contains wheat pasta, broccoli, and peas, which are coated in this creamy white primavera sauce. One thing we noticed was that the freeze-dried fruit actually tastes better freeze-dried rather than rehydrated. The closest comparison to how it tastes would be to eating a crunchy “fruity” cereal like Captain Crunch. Of course, this is a personal preference so you might find you like them rehydrated. The pricing for your food supply is going to vary based on what you decide to purchase. If you’re ready to get serious about building your stockpile, you’ll want to look at their value or premium options. You can get the one month food supply value kit for $139.95, a three month’s supply for $399.95, or a one year supply for $1049.99. Their premium kit will cost you $339.99 for one month of food, $879.90 for three months of food, and $3199.99 for one year of food. You can also buy specific meals if you want to be more selective about the food you receive. Each individual lunch or dinner entree will cost you $11.95. The breakfast options are more expensive at $19.95. Fruits and veggies, however, will range in price from $9.99 and up. Overall, Valley Food Storage is worth considering for anyone who wants to build up a stash of emergency foods. They provide handy kits with an assortment of meals, all of which are surprisingly flavorful. The kits make it easy to stock up on dehydrated and freeze-dried meals, but having the ability to purchase individual items allows you fully customize your order to your needs—perfect for camping or even road-trips. It really is the best way to go for long-term food storage. 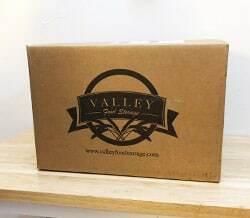 Disclaimer: We received a free variety box of Valley Food Storage products for our honest opinion. We were not compensated to create this review. Have a question about Valley Food Storage, emergency food storage kits, or long-term food storage options? Leave a comment below and we’ll get back to you ASAP! This looks fantastic! Thanks for the information, I will definitely be ordering soon!